Timor-Leste continues to have some of the poorest outcomes for health in Asia. Preventable diseases and conditions such as malnutrition, tuberculosis, diarrhoea and mosquito-borne diseases are all endemic – all diseases that could be largely prevented through basic knowledge on health and hygiene practices. In response to this need, Mary MacKillop Today’s Health Literacy Program trains teachers on how to convey vital health information in a fun and interactive environment, using games, music, drama and puppetry to engage and educate primary school children. This project also works to transform the whole school environment through the provision of awareness raising events and training for parents, competitions for teachers and students on various key health challenges, the distribution of hygiene kits, and a small grants program to help support the schools to obtain essential infrastructure or equipment that are inhibiting them from implementing healthy practices. Conduct 5 day Health Literacy training workshops for teachers in targeted areas. Conduct 2 day Refresher Training for teachers. Provide teachers with a set of health resources to use in the classroom, including posters, puppets and music CD’s. Conduct follow up sessions to monitor each teacher’s application of skills in the classroom and offer feedback and mentoring. Conduct Health and Hygiene Awareness Raising sessions for parents and community members. Facilitate innovative health promotion activities in schools, including student-led health competitions, performances, and the provision of small grants to participating schools. Training for more than 100 teachers in preventative health, sanitation and nutrition. Transform the environment in 20 pre-schools and primary schools to support health practices and behaviours. Provide basic health education to parent groups, reaching more than 1500 parents. Ensure over 6,000 students have gained knowledge in basic preventative health and are supported to implement healthy practices. Contribute to improving long-term health outcomes in participating communities. 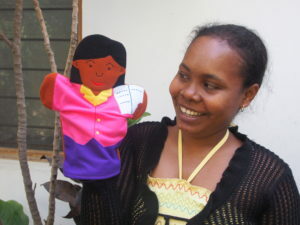 To view a short film on Mary MacKillop Today’s Health Literacy Program in Timor-Leste click here.